Is The SportPlus Indoor Rowing Machine with Heart Rate Strap Receiver A Smart At-Home Model? 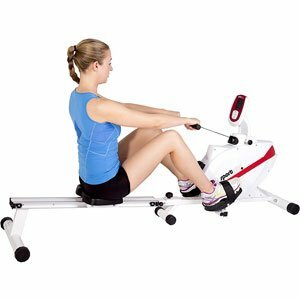 The SportPlus Indoor Rowing Machine with Heart Rate Strap Receiver in Rowing Computer is a clean looking rowing machine with the white body and rail, and the a little red detailing on the console and casing. There is an interesting blend here between a machine that looks accessible to different users – particularly those working out at home – and something a little more high-tech. This is down to the shape and design of the console and the inclusion of the pulse sensors. There are sure to be plenty of high hopes with this device, but does it deliver on them?